When Vincent Nichols moved to Westminster, pretty well immediately a major change happened in the Cathedral Sanctuary. The 1970s mobile, now-you-see-it-now-you-don't, altar was taken out of use. I have always given VN credit for this. 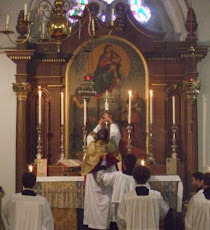 Few traddies would be prepared to, because Traddidom is much preoccupied with the idea that the priest should be facing in the same direction as the Congregation; and, at Westminster, the original High Altar is far enough forward for Eucharistic Celebrants to get behind it and thus face the People. Which is what they do. However, this post is not re-entering the old ad Orientem controversies. What I am looking at today is the principle that, in the Sanctuary, there should be one Altar. I believe that liturgists of all schools share this view. It has a theological rationale. The One Altar bears witness to the fact that there is but the One Sacrifice of the One Lord. I've recently seen ... I think it might have been in the Eponymous Flower blog ... a picture of a church in Ferrara where, just as used to happen back in the dear dead 1970s, what we have come to call a "coffee table" has recently been intruded between the old (baroque) High Altar; and the People. Aesthetically, of course, this is perfectly horrible. But it is not aesthesis that I am mainly now discussing. My point is that the unicity of the Eucharistic Sacrificial action is here blurred. And blurred, in my view, diachronically as well as synchronically. In a double-altared sanctuary, the clear implication is that what is now done at the new "coffee table" is not the same Thing that used to be done at the original, structurally authentic, High Altar. Contrary to Benedict XVI's 'Hermeneutic of Continuity', it is visibly taught by such arrangements that a Rupture has occurred; that something New has been intruded. It is most deplorable that this sort of theological, liturgical, artistic vandalism is still occurring, half a century after the exhilarating catastrophes of the 1970s. There are few things more archaic and out-of-date, more clinging-to-the-past, than the fashions of the 1970s Trendy Mafia. Original authenticated surviving proponents of this base culture should be professionally stuffed and mounted and preserved in easily accessible museum collections so that crowds of keen young traddy home-schooled children could be taken along to look at them and have a good laugh. This needs to be done urgently, while there are still some of the dear old things left unstuffed. Although I agree that there are theological reasons for not having two altars in a sanctuary, it is surely preferable to have a coffee table, that can be easily removed, than permanently destroy a High Altar, which may be a great work of art that may never be replaced. The "best" I've seen is the arrangement at Ampleforth Abbey. Under the great arch at the entrance to choir is a double altar arrangement with central tabernacle, as often seen in religious houses; one for the choir and one for the nave (1925, Scott and Gough). To this arrangement two further altars have been added, so now four altars stand in a line. It would be lovely to think that they all get regular use, even better at the same time - how simple mega that would be, but somehow something deep down tells me that they haven't moved on (developed) to this just yet. I think with the prayers of that great Yorkshireman, Dom Roulin, they could get there yet. - what is now done at the new "coffee table" can still be the same Thing that is done at the High Altar, just done in a different way (a meal eaten around the kitchen table can be just as nutritious, and just as familial, as a meal eaten in the dining room, but the externals of the two are very different). But many sensible people seem to think it is a strong argument; have I missed or misunderstood something? Moving the wall back was in lieu of an earlier scheme to move the altar forward to be centered under the ciborium. The General Instructiion of the Roman Missal agrees that there should be only one altar but allows an aesthetically valuable old altar to be retained. "303. In building new churches, it is preferable for a single altar to be erected, one that in the gathering of the faithful will signify the one Christ and the one Eucharist of the Church. In already existing churches, however, when the old altar is so positioned that it makes the people’s participation difficult but cannot be moved without damage to artistic value, another fixed altar, skillfully made and properly dedicated, should be erected and the sacred rites celebrated on it alone. In order that the attention of the faithful not be distracted from the new altar, the old altar should not be decorated in any special way." This has been done in a number of cathedrals (e.g. Chartres) where the original altar is at the far end of the choir/quire but a new alrar has been built in the crossing to be closer to the people. I thought of the same thing, father; a museum of Liturgical Insanity! It would keep the horror of past mistakes before our eyes so that we do not, hopefully, make them again. Perhaps they should have one of these in every diocese. "the principle that, in the Sanctuary, there should be one Altar." There is ONE Altar to God and ONE altar to the People. One is for a Catholic Mass and one is for a NeoProtestant service. Now there should be no more confusion. https://catholicherald.co.uk/news/2010/10/21/the-cathedral-shows-us-the-way-ahead/ by Fr Anthony Symondson SJ. When Servants comment brought the idea of a museum to my attention, I immediately thought of Fleischmann's perspex sanctuary furniture from Ogle Street. Google helped me find it installed in St Patrick, Redfield, in the Diocese of Clifton. I confess that as I remember it from Ogle Street, it was grotesque, but the picture of it installed in Bristol might change my mind. The exuberant decoration is of a baroque complexity, and possibly the altar and ambo fit in, even provide a still centre where the heart can focus. I agree with Fr Hunwicke. And it makes me weep when I see a magnificent altar in an ancient church partly obscured by a plain 'butcher's block' type altar as they are in many French churches and cathedrals. You kneel down to pray and the beauty of the High Altar is lost. To RichardT: You are quite correct in Catholics having no problem with there being multiple Masses going on at multiple altars (either simultaneously or sequentially). It seems to me that the problem with the double-altar sanctuary is that there already was (and still is!) an altar in the place where Mass is to be said, but that altar is--by the very fact of setting up a new one in front of it--apparently not appropriate for doing what we are now doing on the new altar. This is, perhaps, a different way of saying what Father Hunwicke said above: "In a double-altared sanctuary, the clear implication is that what is now done at the new "coffee table" is not the same Thing that used to be done at the original, structurally authentic, High Altar." This is also why many Catholics oppose new and undignified table altars in sanctuaries that have never had an ad orientem high altar. If the new altar is dignified and clearly in continuity with the old style of building altars, then perhaps it can be justified (I think, for example, of the grand freestanding altars under ciboria in medieval churches of Rome and elsewhere). But if it is clearly "something different", either by its positioning in the sanctuary in front of another perfectly good altar, or by its utter rejection of the continuity of construction, then Catholics are right to reject it. The second altar at Westminster Cathedral was indeed movable and temporary, After it was removed from the sanctuary, it was temporarily stored in a side chapel and then in the hall. it was of simple steel box section construction and could be moved by four people. Two lesser points - I am not sure the temporary altar was mobile, - E sapelion. provision of a portable aluminium nave altar on wheels and a ‘temporary’ altar set up under the Rood for the 1982 papal visit, but these were not judged to work well. In response to RichardT, I would argue that the altar in a side-chapel is clearly the same type of thing as the altar in the main sanctuary, therefore there is no confusion. Similarly, one's kitchen table and dining room table are in the same category with the same purpose; even though one might be larger or more expensive than the other, they are the same type of thing. But when there is both an altar (a place to offer a sacrifice) and a table (a place to eat a meal), and the "action" of the Mass is transferred from one to the other, that seems more significant and suggests a change in the nature (or at least the emphasis) of the Mass. I think some may have missed, if not the essence, at least a pivotal element in this post: that when there are two altars, there is visual evidence of a rupture in Eucharistic praxis and, hence, Eucharistic belief. This cannot but affect the faithful's beliefs on some level. I would also note in passing the GIRM's instruction to keep old altars unadorned in any way. Fortunately, this is widely unknown, perhaps sometimes known but ignored, but there is something jarring and really, insulting, to see an altar stripped of even an altar cloth. Again, it speaks volumes about the attitude to be taken to 'previous' Eucharistic belief. Regarding pelerin's comment on the proposed new museum in front of Chartres Cathedral, here is an article with renderings. If you have been to Chartres in tne past year or three, you will know that the interior has been attacked by the architect of the Monuments Historiques" The wonderful darkness/blackness inside is gone and the walls have been painted white with faux-marble paint on columns to recreate what the architect believes was its past appearance. More work is to follow. I cannot remember when, but between the mid-90's and mid 2000's, there was some dubium to the CDW, I believe, that emphasized the unicity of the altar and that a newer altar should NOT replace an older high altar, and that, if it had historic and articstic value, should be returned to us. There is also a 1993 Notitiae article that is useful here. #3 under the principles is helpful. Also, I have not had time to go through the Notitiae Responses site recently. There may be something there. It is a very valuable resource, though one many people do not seem to know about.